Yangshuo (阳朔) is about 3 hours’ drive away from Guilin and is a popular tourist county in Guangxi Province. Karst mountain peaks, twisting rivers and beautiful scenery ideally surround this small tourist destination. Arrive at Guilin airport from Ximen; a business van will meet you at the Guilin airport and take you to Yangshuo Tea Cozy hotel. Check in. Free time at night. Stay at Yangshuo Tea Cozy Boutique Hotel, with breakfast. After breakfast, enjoy a bike ride along the Dragon River to the Old Dragon Bridge and Fuli Stone Bridge. After that, take a bamboo raft ride from Jinglong Bridge down to Jiuxian Bridge, then cycle to Jiuxian Old Village and back to the hotel. Free time at night. Stay at the same hotel. Visit a tea farm and Xianggong Hill in the morning. After that, hike along the Li River to Xingping Town, and visit Xingping Old Street. Drive back to the hotel. Watch the "Impressions" Show on the Li River in the evening. Free time at night. 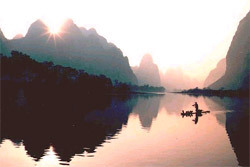 Cycle along the Yulong river to Moon Hill to enjoy the beautiful countryside of Yangshuo. Enjoy lunch at a local farmhouse before cycling back to the hotel (different from the route in the morning). Free time at night. In the morning take a Chinese cooking class, and have lunch there. In the afternoon, take a van back to the Water Cave. Back to hotel. Free time at night. 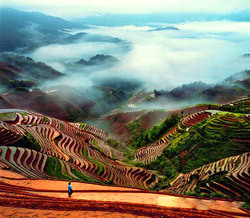 After breakfast, drive to visit the Longji Rice Terraces. Visit Dazai Yao Village, and then hike to Tiantou Village. In the afternoon, hike to No. 2 Scenic Spot. Stay at a wooden guest house in Tiantou Village. Hike around rice terraces to No. 1 Scenic Spot and No. 3 Scenic Spot, then go downhill and drive to Guilin. Free time at night. Stay at Guilin Eva Inn hotel. Explore Guilin city by yourself in the morning, then go back to the Guilin airport by van and say goodbye. 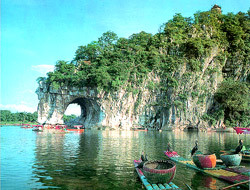 The prices of the Yangshuo tour packages are subject to season, air fares and number of group members. Please contact Apple Travel for the latest information.